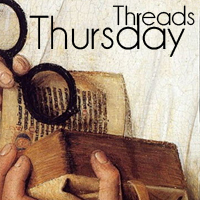 Historical Tapestry: Thursday Threads: Do You Love Your Library? Thursday Threads: Do You Love Your Library? I just went to the library to pick up a copy of Les Miserables so that I can get a bit of a start on the book in anticipation of our readalong. I love my local library. I love to own books too, but there is limited budget and limited space. So my question this week is about libraries. Do you use your local library? What do you love about it? Or do you prefer to own your books? Kelly: I go back and forth on my library usage. I loved it as a child, but then I sort of lost interest. I would browse the catalogue and never find anything I was looking for. I would use the one at school, but never got back into using the public one until 2009. I was a bit obsessed for a while, but slacked off this year. That is mainly because my reading has waned so much this year. If I was reading more I would still be there all the time. My favourite thing about it is that it is like I am getting new books all the time but without the strain on the finances. I still prefer to own my own books, but sometimes that can’t happen. I love my library...it's convenient (around the block from my house) and has a decent collection. We also have a good library system - 2 counties of libraries have joined together to allow sharing of materials, so even if my library doesn't have a specific book I want, it is very easy to get it from another library. I go in spurts with using the library. I do get the majority of audio books from the library. Then, if there is a book I do not want to buy, I will get from the library. We are lucky too because if I can't get it at my local library then we can search the library collection of many of the other library systems in the state and get it sent through, and it's a free service. I often get books I am not sure of from there and then will buy it if I love it - particularly cookbooks. I, too, used to go to the library when I was younger and enjoyed it very much. As I've gotten older, I don't use my library, even though it's very convenient for me (just a couple of blocks from my apartment building). I prefer to buy my books. However, when I'm done with them, I donate them to the library to use or to sell in their "reading room" book sales that they have. I find it really difficult to part with books once I own them! I use the library all the time, even though I have plenty of unread books at home. There's always a title that seems particularly appealing at any given moment and it's so easy to borrow it from the local branch. The cost is of course a factor and because our library system is excellent (they have a lot of recently-released best-sellers as well as older titles in both paper and digital formats) I can usually get away with not buying books at all. Since I tend to read quite a bit and not re-read books buying them is more often than not a needless expense. But if I read a book and decide that it's a keeper then I'll go and buy it for my home collection. Olga, your answer could have been written by me! That's pretty much how I work too! I love my library and depend on it for most of my reading. Our libraries in New Zealand are fantastic because books are incredibly expensive to buy here. Yes, books are really expensive here in Australia too! My library is pretty spaced out too, although I think that is just to make it seem more bright and light! I'm wildly in love with my local library :) I use it constantly and faithfully and I don't know what I would do without it! I buy all of my books. I do, however, periodically purge my shelves to make room for new books and I donate almost all of the books I decide to part with to my local library. Our library doesn't accept book donations. No idea why really but still. I always end up grabbing a book or two even though I have a gazillion books at my house to read. No wonder I can never catch up! I am at my library at least once a week, usually twice! I rely on my local library! I go there weekly if not more and can get upward of 10 books each time. 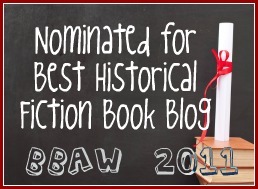 As a writer, I'm not only getting fiction but research for my historical fiction and there's no way I could afford all those books! Thank you to Libraries! I don't know what I'd do without them. I am so glad that you stopped by Stephanie. Fantastic to hear from a writer who uses their library. I love my library and still frequent it although, the books I own do need to be read. I can request almost any book I want from the library, and there's always something on the shelf that interests me. I know I'm lucky in that my city library system is fantastic. I got most of my reads form the library until I started book blogging. Now the tables have turned. That's why I want to read everything I own and go back to supporting the library. the more check outs the ore it shows it being used. There are two things I don't like about my local library. First, they almost never have what I'm looking for. Second, if you want to get an ILL outside of the library system you have to go to the library in person to request it. Items within the system can be ordered online. Until recently I worked in a college library. I was lucky--my job was ordering the interlibrary loans! I could get anything I wanted within the U.S. including the newest books. I was in book heaven! Oh how I miss that job (I lost it in July).